This past weekend I did what I tell other people not to do. I spent the bulk of the weekend at my desk and computer, studying, writing a paper and reading a textbook. In all, I likely logged 20 hours sitting in my chair, typing, reading and researching. 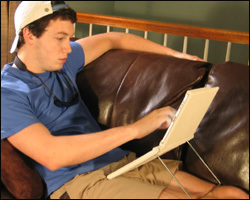 I did use my Port-A-Book to hold my textbook but even with good ergonomics, sitting for that long take sits toll. The result: I got a lot of work done, but I also felt exhausted, my back and neck hurt and I felt my immune system wearing out. I missed my weekly, long forest preserve hike and overall, I missed my weekend. I don’t do this often and I don’t advise spending the weekend working or computing, especially if that is what you do all week at work. Now research shows that you do on your weekend can effect how well you feel and how productive you are during your workweek. A study conducted by German researchers on emergency medical service (EMS) workers showed that weekend time spent socializing with friends and family tended to reduce workers’ burnout and increase their general well-being. Kind of a no brainer, don’t you think? But many people who work long hours during the week in office jobs that come home to a weekend of more work done in front of their computers. Why do we work so hard? For some, it’s a matter of managers giving workers too many tasks to complete in too little time. But if your manager is one of those people who doesn’t believe you should have time off from work on the weekend, you may want to share the results of this study with him or her. AND, if you are the one that drives yourself to work during the weekend, you may want to read more about this study yourself. And then, give yourself some time off! You will be glad you did. Non work hassles correlated with poor general well-being post-weekend and lower performance in daily work tasks post-weekend. So fighting with your spouse tends to make you feel less healthy and perform more poorly at work the next week). Workers engaged in more social activity on the weekend reported higher levels of general health and well-being as well as better task performance post-weekend. A high amount of non work hassles tended to associate with lower pursuit of learning post weekend. Higher positive work reflection on the weekend led to higher pursuit of learning post weekend. Exhaustion was significantly related to task performance (those more exhausted did less well on task performance). The study recommended that workers try to spend more time in positive social activities during weekends and free time. Employers and organizations could use this study as support for considering reductions in workload and allowing for breaks or comp time after periods of intensive work activity. I, for one, will be taking time off from the computer and my textbooks for next few days for Thanksgiving activities with my family and friends. And I will be giving my back and neck a much-needed break. And maybe even get some hiking or swimming in! A Cure For Burnout and Stress–As Simple as a Walk In The Woods! Aside from achieving better Fitness by hiking and exercising in the Forest, there is ample evidence that exercising or interacting with nature (even having live plants in your work environment) helps combat burnout, reduces mental stress and reduces mental fatigue. Read on for more about this research and it’s implications for our daily lives. Professor Rachel Kaplan’s office at U-M’s School of Natural Resources and Environment looks out over a large oak tree. Potted plants crowd her window sill. Beyond these small patches of nature loom the buildings of central campus. But, she says, a little bit of nature goes a long way. She would know. Kaplan and her husband, professor Stephen Kaplan, were among the first academics to study the psychological benefits of nature. Colleagues and collaborators for decades, they have shown that natural settings—trees, grass, gardens, and the like—have a profound, positive impact on both mental and physical health. • Studies by Bernadine Cimprich showed that the psychological health of cancer patients “improved dramatically” after they spent 20 minutes a day, three days a week, doing restorative activities such as gardening or walking in the woods. A control group that did not do the activities showed notably less improvement. • Studies by Frances Kuo and William Sullivan found that residents of public housing projects who live near trees “showed all kinds of benefits,” says Stephen. “More civility, less aggression—and girls were more likely to study” their schoolwork. Better yet, says Rachel, the natural setting “doesn’t have to be big or pristine” to have a positive effect. “Most of all, it has to be nearby.” A study by Ernest Moore of prisoners in Milan, Michigan, showed that simply having a view of farmland from a prison cell reduced inmates’ need for health care. To escape the discomforts of mental fatigue, people often turn to activities that “capture” their attention. They find external events to distract them, so they don’t have to concentrate so hard. Watching TV, for instance, requires little willpower: the programs do the work, and the brain follows along. Similarly, says Stephen, “many people find an auto race fascinating.” Fast motion, loud noises, and smells captivate the brain. The Kaplans refer to activities like watching TV or sporting events as “hard fascination.” The stimuli are loud, bright, and commanding. The activities are engaging and fun, but they don’t allow for mental rest. Soft fascination, on the other hand, is the kind of stimulation one finds on, say, a stroll along the beach or in the woods. Nothing overwhelms the attention, says Stephen, “and the beauty provides pleasure that complements the gentle stimulation.” The brain can soak up pleasing images, but it can also wander, reflect, and recuperate. Most people, say the Kaplans, intuitively know this. But often, they either don’t do it, or they may not have opportunities to get out in nature. That’s too bad, because the Kaplans have shown that if you’re upset, frazzled, or suffering, an easygoing walk in the woods or even along a tree-lined street is one of the best things you can do for yourself. Read more about the Kaplans and their research here. • Plant a garden. Even in the city if you have an outdoor porch you can plant a small garden in pots and window boxes. Weeding the garden, “playing” in the dirt, and taking the time to nurture your plants, nurtures your own nervous system and allows you some peaceful moments free from everyday stress. • Bring live plants into your workspace. Live plants help clean the air and make your environment naturally beautiful and less stressful. • Go for regular walks in nearby forest preserves or parks. • Make after dinner walks around your neighborhood part of your family routine. This is a great way to spend quality time with friends and family, get regular exercise and get away from the stress of the TV, telephone and temptations of junk food. • Volunteer in a nearby community garden. Cabrini-Green Community Vegetable Garden (taken by Strannik45). • When possible, alter your driving route to go through area parks, forest preserves or stretches of the road that gives you a view of Lake Michigan, trees and natural bodies of water like rivers and ponds. • Plant an indoor herb garden in a well lit window for the winter. It gives you the double benefit of fresh herbs for your meals and the moments of stress relief you get when tending your mini-garden. • As much as possible, exercise outdoors. Run and hike in the park or forest preserves. your laptop to the beach or park. In inclement weather find malls or indoor public spaces with plants and trees.